Like most people in the northern half of the northern hemisphere, I am rather non-plussed by post-holiday Winter. Maybe non-plussed is an understatement. And maybe getting lost in the suburbs and enduring auditory assault from a kiddo who REALLY WANTS GUM! is enough to drive anyone to an existential crisis. But I knew that this was the beginning of my yearly bout with the Winter Blues. And of course I know how to work myself out of a funk (dance to Shakira! cuddle the cat! try something new!) but when you’re a two weeks into your January-sulkathon, it’s hard to work up any interest in doing things other than watching Hulu and eating carbs. However! Being the internet hound that I am, I remembered hearing about this study. Essentially, it points out that when doctors give patients vague, over-arching suggestions about exercise and diet, these suggestions are largely ignored. But when the doctor gets out her prescription pad and actually writes out a specific, tailored plan for these things (“30 minutes of walking, after evening meal, 4 times a week”) the patient is much more likely to do these things. So what if I applied this method to myself? Instead of knowing (and mostly ignoring) all of the things that I know I can do to pull myself out of funk, what if I viewed these things as the treatment for my Mid-Winter Sulk? And you know what? I think it’s working. All that air and sun and sweat makes me feel better. Of course it does – I knew it would. But viewing all these activities as non-negotiable has changed my mindset. You wouldn’t willfully forget to take your allergy medicine or to wear your mouth guard while playing hockey. Why shouldn’t we treat our minds and hearts the same way? What would your prescription for happy be? I am new reader, been lurking for a couple weeks, but this post hit hime for me. I have been having an existential crisis myself that I have been talking about on my blog. Man, talk about a nightmare….but at the same time, I feel pretty lucky to be going through this as it has made me introspective. Without this crisis, i may have been one of those people that dragged themselves though life, without understanding the true meaning (as it is interpreted by them). Hope the script works! I have my script as well and it includes a few that are on your list as well. Oh Sarah, thank you!! This is exactly what I've been needing lately… I just feel as though I've lost all motivation to do anything besides eat snacks and pretend to work out (aka – lie on my back and relax on my yoga mat haha)… so I started a jounal yesterday. All I've written in it so far is "Intention: to simplify"
Just what the doctor ordered. Or, rather, just what I'm going to order myself! I've found this to be true – if my goal is really specific, I'm more likely to do it. A couple weeks ago, I decided I would walk my dogs five times a week for twenty minutes each time. I've managed to stick to it pretty faithfully. Now my dogs start prancing around the door when it's about time to go. To help me stick to some of my larger goals for the year, I started a blog about them. Having to write about them most days really helps me stay focused on them. It's only two weeks into the year, and I'm already pretty happy with my progress. And as a fellow midwesterner, I love that you included over-priced fruit in your perscription! Sometimes, a little sunshine in the form of fruit is the perfect winter antedote! I think your right. 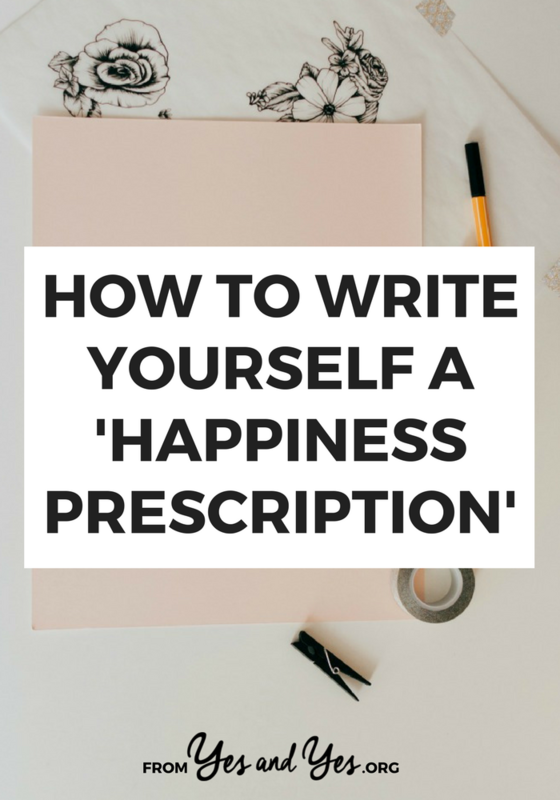 We should all write ourselves a prescription for happy! I hope you don't mind if I use this as a topic on my blog? It's just too much fun not to share with more people! Cooking something warm and satisfying but also healthy, like a thick vegetable soup or a fresh piece of fish. The smells and the warmth from the stove always make me feel better, no matter what kind of day it was, haha. I've been sitting on a list of 25 ways to beat the winter doldrums that I need to turn into a blog post before, well, spring happens. I was surprised as hell that I came up with 25 things as I normally despise winter. * 1 square of dark chocolate by mouth once daily after evening meal. * 30 minutes of walking with the puppy daily. * 1 hour of uninterrupted writing time daily. * 2 new outfit purchases monthly. I also was on the verge of an existential crisis this weekend thanks to the lovely post holiday winter blues. A couple things that I prescribed to myself as soon as I recognized the signs were the same as you. I firmly believe that instead of saying I need to exercise, I have to be specific about the activity. I arranged a day trip to ski, and then a squash match the next day. Additionally, instead of holing up in my room and feeling sorry for myself, I made myself go out to dinner with friends. Keeping busy and active, with specific goals in mind, is the only way I've found to beat the winter blues and keep the glass half full mindset! 1. Read for 20 minutes before bed for true unwinding. 2. Drink your entire water bottle EVERY DAY. 3. Off to the gym 4 times per week, don't skimp on the weights. 4. Work on outfit list every other week. 5. Nookie. As often as possible. Americas Funniest Home videos…let's face it people falling and getting hit in the crotch is enough to make everyone laugh. Fact: I am addicted to your blog. Addicted. It makes me feel good. Warm and fuzzy. I keep tweaking my prescription … this time of year, it needs to be double-strength. Digging out my pretty summer dresses and wearing them around the house, because for one thing, it's too damn cold to go out in them, and I feel bad for leaving them in the wardrobe for 5 months. Amd screw it, I will wear florals to do homework in if I want to. 1. I moved into a new flat and am still decorating. I am therefore surrounded by colour and inspiration. 2. My new flat has creamy pumpkin coloured walls in the kitchen and living room, and they fool me into thinking i'm somewhere sunny. 3. I've been making a real affort to see friends, rather than sitting in the house like a cold, grumpy hermit. So basically, it's all about movement, colour and light. Get as much as you can! You don't know how much I needed this this morning. I can get over the blues, it's a matter of effort and positivity. Thank you. What a great idea! What does that say about us, as a culture, that we take orders to pop pills more seriously than advice to take care of our health in commonsense ways? My husband has a prescription "sun box" light for Seasonal Affective Disorder that makes any room feel like summer. All these work for me! Oh, and NEVER going to Walmart. Ever. Blech. Dude, writing it out and making your happy time non-negotiable is a fantastic idea! I'm pretty okay with the weather, but I'm addicted to writing intense to-do lists and sometimes get overwhelmed looking at all I have to do. A few years ago, I realized that putting things like "watch House" or "take a bubble bath" on my to-do list really helped keep my stress down. Excellent idea — it is true, when I write down very specific goals, I tend to stick to them mentally! I also need to apply the "getting more sunshine" thing — I just want to hibernate in the winter, which is BAD! I'm a firm believer of fake it till ya make it! When I'm feeling down I ask myself "what would I be doing if I wasn't in the dumps?" & then I get to it. This is such a fantastic idea. As a fellow Minnesotan, I too, find this time of year to be incredibly difficult. I'm coping fairly well right now, but I know once February hits, the slump will begin. I may have to try this. I'm wintering for the first time ever not in Iowa or in northern Russia, and am loving the mild weather here in Georgia (country, not state). But all the same cabin fever can hit at any time, and I love the idea of writing a perscription! Thanks for making every day brighter, Miss Von! Alli – Wow! Winter in either Northern Russia *or* Iowa?! You are a trooper! 2. Stroking and fussing my cats daily. 3. Writing a little something every day. 4. Taking Omega 3 and vitamins every day. 5. Keeping up with my art and sign language classes each week. 6. Continuing on my journey with The Secret. I obviously need a slightly longer prescription than most!! this is fantastic. I may have to do the same thing. It's starting to feel a bit like summer here in Welly, Sar! It's the third day of sun in a row – gadzooks! A miracle! What a great idea! Thanks Sarah! lovely! just what i needed! I think with exercise, and everything similar (rewarding but hard to start), it's good to start small. I started swimming by saying that I would swim every day, but not worry about distance, speed, or time. Just improve my technique, and enjoy myself. Over time I got the distance and speed anyway! Doing something every day, just for 5 minutes the first week, and then 10 the second, 15 the third etc, is a very good way to start a habit. I think what I'm saying is that your blog is definitely part of my prescription for happy! * At the end of the day sit down with a cup of tea and your favourite chocolate and watch a crappy DVD. I can't relax unless I've earned it first! What a completely inspired post! I love it. I'm not entirely sure, but I think you're writing this blog specifically for me. Yeah, it sounds selfish, but every time I mosey on over here there is some piece of advice that hits home. So uh… I'm going to NOT report you to the government and let your telepathic skills continue to encourage me to be a better person. Sewing (Every day, for at least one hour). Walking and yoga (To be applied for 30-60 minutes every day after work). A new book (once a fortnight). Cuddles from The Boyfriend (stolen as often as possible). Subway cookies (Once a week…ok, maybe twice a week on work lunch breaks). Definately going to have my own prescription!!! Such a good idea! I'll write my own prescription now! I might have to take the sunshine and fresh air at 7am and 3pm prescription. Mostly because I don't see 7am anymore due to winter lethargy, and I think I need to again. These are all great ideas, Sarah! I've started devoting at least 30 minutes a day to exercise (a combo of cardio, strength, core workout and Yoga), and I do feel better. I'm also taking a daily vitamin (the Flintstones!) to ensure I'm getting the vitamins and minerals I need. I totally dig your Will Not Negotiate with Terrorists stance on this. Well done.